Sarah Louise Shore Johnson, 85 years old, of Harmony passed away on January 17, 2018. Sarah was born in Yadkin Co., NC on August 14, 1932 to the late Calvin and Fannie Shore. Sarah was predeceased by her beloved husband, Thomas "Bruce" Johnson in 2015; her son Bobby Johnson in 2000 and 5 brothers and sisters, Lois, Edward, Gladys, Alex and Patty. 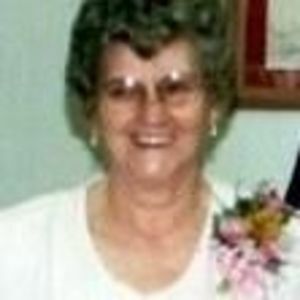 She is survived by her son Dean Johnson and his wife Ruby of Harmony; her daughter, Mary Louise Sides and her husband Joe of Mooresville; her sisters, Leola Barr of King, NC, Mary Alexander of Harmony and Carolyn Collins of Yadkinville, NC; her grandchildren, Sammy Johnson, Tori Cearlock and Dakota Johnson; 3 great grandchildren and many nieces and nephews. The family will receive friends on Sunday from 1-2pm at the Bunch-Johnson Funeral Home, 705 Davie Ave., Statesville with a 2pm service to follow in the funeral home chapel. The burial will be held privately on Wednesday at New Hope Baptist Church Cemetery. In lieu of flowers, donations may be made to the Iredell County Hospice or New Hope Baptist Church in Sarah's memory. Bunch-Johnson Funeral Home is honored to be serving the Johnson Family.